Ferradini was born in Naples in 1718 where he studied. He journeyed to Parma and to Madrid and then in around 1760 to Prague. Though his works were quite widely performed there and elsewhere – not least in Germany – he died a pauper in his adopted city’s Italian hospital. A number of his operas are extant though frustratingly libretti only – a few isolated arias survive – and a number of his works were still being performed many years after his death, so that his music didn’t simply disappear overnight. Of these works his Stabat Mater is probably the best remembered and as Alberto Iesuè reminds us in his sleeve notes an edition was reprinted in Milan in 1969. But he is also remembered for instrumental works and for these harpsichord sonatas in particular, which are preserved in Dresden and which are conjecturally dated to c.1760, the time of the composer’s relocation to Prague. Iesuè is quite right to dissociate them from the grandly virtuosic works of Domenico Scarlatti with which they have little in common. They are clearly of the Stile Galante and strongly resonant of the prevailing orthodoxies in the French and Italian styles. 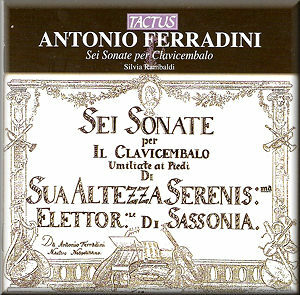 That said however these – in the main – four movement sonatas (slow-fast-slow-fast) have plenty of harmonic and lyrical interest and are imbued with Ferradini’s prevailing sense of melancholy and it’s this that generates perhaps the most permanent interest in these expertly wrought and diverting works. Silvia Rambaldi writes eloquently on matters of performance and she puts her words into practice with playing of assurance and intelligence. The second movement of the First Sonata for instance is played with considerable vitality, its tutti/soli sections clearly delineated and with cadenzas interpolated on the fermatas on the final note of a phrase. Her exploration of the extensive Larghetto sostenuto reveals its expressive depth quite clearly. Staccati and repeated notes are distinguishing features of the third movement of the second sonata, the finale of which is a vigorous and emphatic Allegro grazioso. His instinct for plangency and expressive contour can also be gauged by the richness of the Andantino amoroso of No.3, a work graced by Rambaldi’s deft articulation in the minuet and the élan of the finale. The French style Prelude of No.4 is a preface to the plays of registers in the Allegro and the plaintive beauty of the Andante grazioso. Auspicious too is the feathery lightness of the lute registration in the finale. The Sixth sonata is the only one to break the four-movement convention; it sports seven. There’s a stately air to the opening with fine embellishments, a lovely left hand melody line and very effective mini cadenzas in the second movement Allegro. The Tempo giusto has a brief fugal flourish and there’s a terrifically engaging and long Minuet with variations followed by a hunt movement. Dance and hunt themes are used with sure appreciation and a stylistic unity. Throughout Rambaldi’s editorial decision-making sounds spot-on and she responds amply to the melancholia as well as to the vitality inherent in these charming and highly effective works. Fine sound and comprehensive notes add to the lustre.